Your Business is your livelihood, and a Damaged Roof on any Commercial Property can cause business loss. Over time, Damaged Roofs lead to a much larger problem which can affect customers, products, and services - eventually leading to Roof Replacement. Don't get caught in that trap, and have your Commercial Roof looked at soon! If your Businesses Roof is Damaged and in need of repair, Rockwall Metal Roofing are the guys to call. Our Team of Commercial Roofing Experts are Certified with GAF, CertainTeed, and Owens Corning. No Business Location is too large or too small for us to repair. 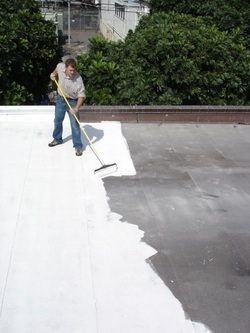 Flat Roofs are much different than a typical Residential Shingle Roof. Commercial Properties have used the traditional methods and materials for repair such as the gravel ballast. Rockwall Metal Roofing uses only the latest and more Cost and Energy Efficient methods of Roof Repair. We feature a much more efficient and cost-effective process that has proven itself time and time again in energy efficiency on Flat Roofs. Not only are we talking Efficiency, but much more Durable and Affordable. Our much more Innovative method uses Single Ply Roofing, which is a higher quality product and boasts solar reflective properties. In this State-of-the-Art method, Solar Reflective Roofing Properties offer cooler roofs and cooler buildings, lowering energy costs. Talk to one of our Knowledgeable Employees or Contractors today about Commercial Roof Repair. You'll be glad you did!